The OG-FIBER-2T is a state-of-the-art, openGear-compatible, two-channel 3G-SDI to Fiber converter, enabling SDI signals to be extended up to 10km over standard single-mode fiber optic cable. The two SDI inputs are completely independent allowing different SDI rates to be carried on each channel. 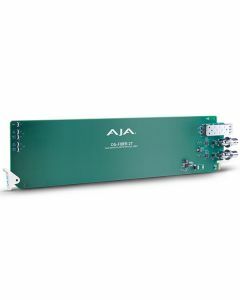 The fiber inputs are re-clocked with best-in-class input jitter tolerance. SDI rates of 270Mb, 1.5Gb, and 3Gb are supported. The fiber connector is attached to the main card for added reliability and cost savings.